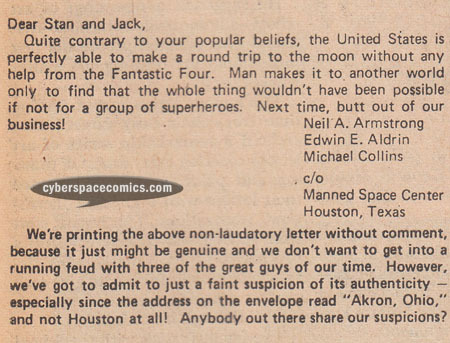 Fantastic Four #103 (cover date – October 1970) features a surly letter from Neil Armstrong, the first man on the moon – and fellow astronauts “Buzz” Aldrin & Michael Collins. Was it really from them? Who knows?! 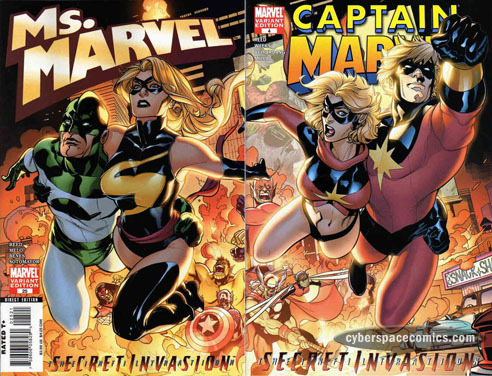 The variant covers of Ms. Marvel vol. 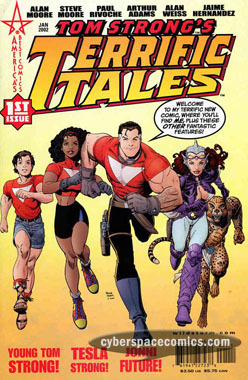 II #25 and Captain Marvel vol. VII #4 connect together to make one image. 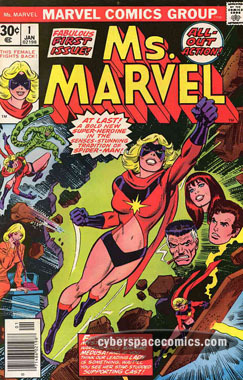 On the left, we’ve got Ms. Marvel in her current costume carrying Captain Marvel (in his first costume). And, on the right, we’ve got Captain Marvel in his current costume carrying Ms. Marvel (in her first costume). What a nifty sense of balance! Continuing the balancing act, each issue is written by Brian Reed and is a Secret Invasion tie-in. 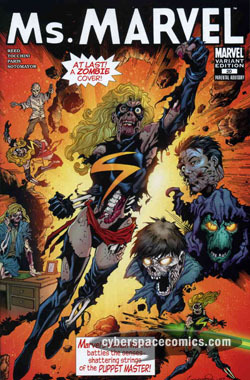 This Aaron Lopresti zombie variant pays homage to the very first appearance of Ms. Marvel . 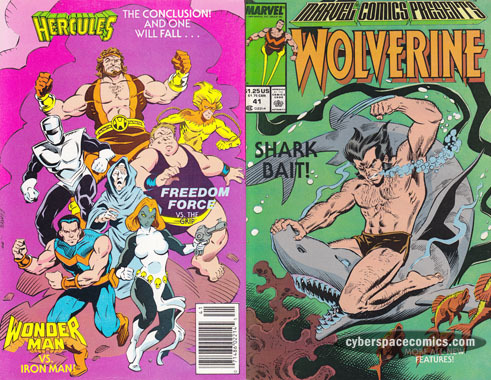 Sailing East out of Hong Kong, Wolverine catches a shark to feed himself and his friends. They stop on the shores of China to share a shark-meat meal and his companions (Mai, Hsiao and Ch’un) reveal how the Black Shadow has negatively affected their lives. The Shadow attacked Ch’un’s school and murdered his students. It scorched Hsiao’s farm, leaving his grandparents dead. And, Mai’s husband and child were killed by the creature. After gaining a better understanding of why his new-found friends want to take down the Black Shadow, Wolverine discovers a stampede of horses headed their way. The Enchantress convinces Wonder Man that Iron Man has been manipulating him for years and is not a true friend of his. So, Simon pays a visit to Stark Enterprises to engage Iron Man in battle. During the fight, Wonder Man manages to tear Iron Man’s chestplate from his armor! The Beast saves the day by knocking Wonder Man out with the blast from a Stark weapon but, Wonder Man disappears in a blink before they can do anything to contain him. Hercules carries his son, Arimathes, to the med-alert flyer and discovers that he’s suffering from internal bleeding and burns over 75% of his body. While Arimathes recuperates, Hercules launches an attack against to Layana to avenge his son and keep her from claiming the crown. He captures her and brings her to their son, lying in his hospital bed. And, when faced with the consequences of her bid for power, she breaks down and begs for forgiveness. Freedom Force has been commissioned to rescue Senator Robert Kelly. He’s been captured by Señor Muerte, who isn’t fond of Kelly’s bid to shut down his Drug Empire. The rescue is a sore point, considering Kelly’s anti-mutant sentiments – but a job’s a job. Freedom Force (Mystique, Avalanche, the Blob, Pyro, Destiny, and Spiral) wasn’t forewarned of Muerte’s super-powered enforces, the Grip (Napalm, Vice, Windmill, Uzi, and Sprint), but this mutant government task force certainly has enough muscle, powers, and experience to save the day. Sending Freedom Force to rescue someone who hates their kind was a neat way to prove their dedication to their government role. Hercules’ story ended on a powerful note but I’m still waiting for the Wolverine and Wonder Man stories to get interesting. Alan Kupperberg is a comics creator who’s written fill-in issues for Captain America, Iron Man, and other Marvel titles. He’s also illustrated fill-in issues of Amazing Spider-Man, Avengers, Captain America, the Defenders, Doctor Strange, Ghost Rider and many other Marvel titles. He had some short runs as the artist on titles like the Invaders and Thor and he was the artist on the Ice Man mini-series of the 1980s. He’s the only guy you can hold responsible for the one-shot, Obnoxio the Clown vs. the X-Men. Before his career began in the mid-1970s, he got a letter printed in Fantastic Four #101 (cover date – August 1970). 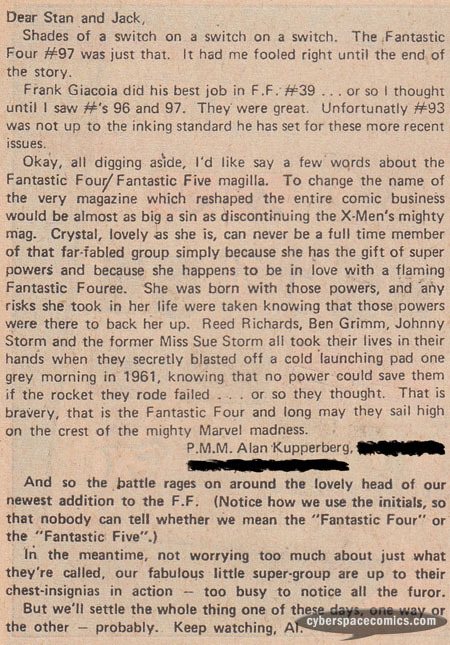 Here, he weighed in the controversy of changing the name to the Fantastic Five to account for Crystal joining the team. 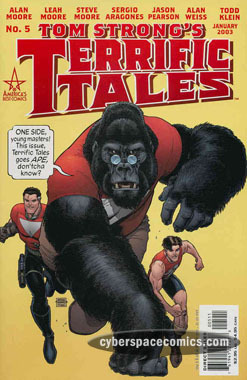 Art Adams re-used his “running forward” cover motif for Tom Strong’s Terrific Tales #1 and 5. Don Maranzano has put a hit out on the head of the Chicago mob, Johnny Castellano, and his about-to-be-born son. But, before Maranzano’s boys can do the deed, they’re offed by the Punisher who then leads Castellano and his pregnant wife to a safe spot. In a bid to wipe out the Castellano bloodline, Maranzano ups the ante – $1M bounty on the baby’s head. Meanwhile, the Punisher has led the expecting parents to a nearby stable to deliver the child and, when the hitmen come calling, he puts them down. As the bodies grow cold around them, an innocent child is brought into the world. But, will the Punisher show mercy for a change and let the parents enjoy their new baby boy … or will they be punished for their crimes, too? There’s a strange dichotomy to this tale – an innocent babe is born amid a flurry of spilled blood but, it’s ultimately delivered into a family of hope. The story creates some clear parallels to Christmas – just as Herod had babies put to death while looking for the newly-born Jesus, Don Maranzano has ordered the death of the Castellano child. There’s a babe born in a stable and, of course, the Punisher dispenses lead (instead of coal) to “naughty” men. 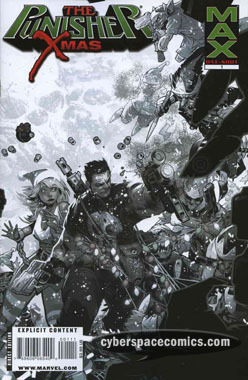 The story is rather straight-forward with no real unexpected twists nor any of the dark humor that I’ve come to enjoy from other Punisher stories. In the end, it’s just a story about a ruthless killer killing other ruthless killers in order to protect the innocent people of the world. 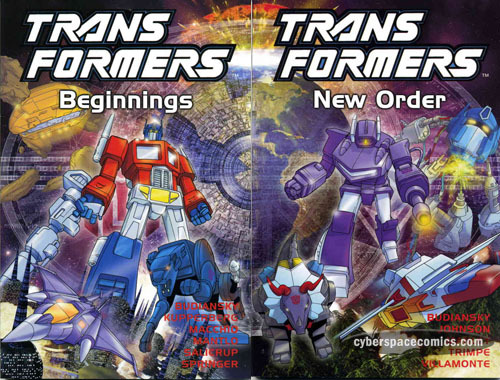 * I think it’s worth noting that there is a mature variant cover available for this issue. The picture posted above is the “PG” cover. Wolverine gets knocked out by a flash of light resulting from the battle between Black Shadow and White Shadow. While he’s unconscious, Wolverine’s brain flashes back to reveal why he came to Hong Kong in the first place: to find the murderer of his friend, Linn. When he comes to, he departs for China with Mai, Hsiao and Ch’un. With Wonder Man going on a rampage, his good friend, the Beast, tries to talk some sense into him. Unfortunately for Hank, Wonder Man’s not quite himself just now – he’s being incited to rage by the Enchantress‘ … er … enchantment. It’s a fact that the Beast deduces when he notices that Wonder Man’s movements seem to be a bit sluggish. Layana‘s plan to take back the throne of Wilamean is in full force as her elite Assassins’ Guild (Akooti, Malicon and Viperus) launches an attack on the current king, Arimathes (her son), Hercules (his father) and the Recorder. In the battle, Arimathes is blown up with one of the assassins! Will he survive the blast? Two government agents warned of a toxic waste leakage near Millwood, New Hampshire – but to no avail. Now that it’s killed the town’s inhabitants, they’ve been sent to investigate – clothed in radiation suits, naturally. To their surprise, they see a healthy rabbit bounding by them. But, do they really see it? Lurking in the shadows is the Overmind, and it appears that he’s using his mental powers to convince them that everything is fine. When, in fact, it’s not. Moving on to the inner parts of the town, they see a functioning society with normal-looking humans. They’re told if they want information, they’re welcome to talk with Mr. Overmind at the schoolhouse. They discover that the Overmind has been using his mental powers to convince the town’s citizens that they’re healthy. He’s also been teaching them the power of positive thinking. But, when the townspeople are confronted with the truth – will they choose to return to their ignorant bliss or accept the desparity of their situation? In this issue, the Enchantress mentions that she’s adopted her sister’s name (Lorelei) as part of her charade. So, that clears up last week’s curiosity. This anthology’s diversity and far-reaching nature are truly proven when even the Overmind can get a solo feature. And, what a powerful story, it is! 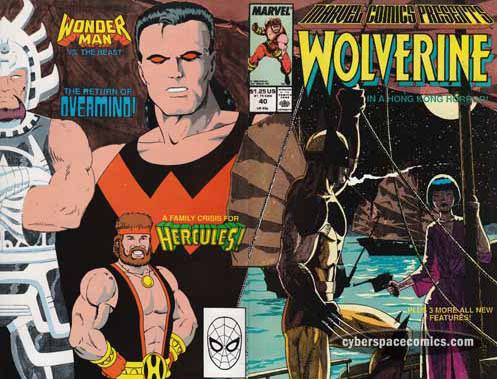 Unfortunately, the Wolverine and Wonder Man features continue to be bland. Hercules, on the other hand, is all out action! Too bad he looks ultra-cheesy on this cover, though.